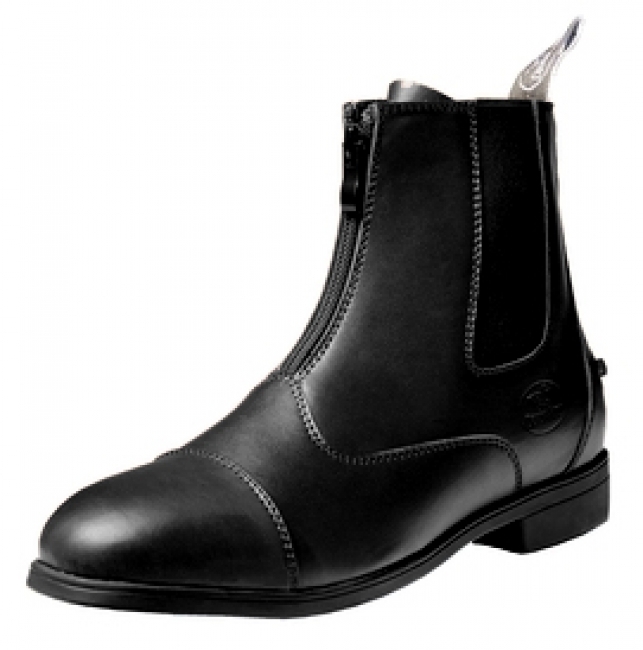 The North Park Boots from Devon-Aire are a perfect, affordable option for the growing young rider. They are made with a leather-like material that is water resistant, breathable, and easy to care for. These boots feature Devon-Aire's Enhanced Shock Protection (EPS) and Thermoplastic Rubber (TPS) Outsole for shock absorption and traction control. The Carbon steel shank provides support. The Total Comfort System (TCS) provides a cushioned comfort insert, promotes air circulation, and wicks away moisture. Additional features include elastic twin gore panels, heavy duty front zipper, top cuff pull tabs, and double stitched toe cap. Clean your boots and restore shine easily with just a quick wipe with a damp cloth! Heavy duty front zipper with oversized pulls for use with gloves. Reinforced toe and heel counters.